Like floor plans, maps are often considered an essential feature in property marketing, both on websites and sales particulars. Delivering flexibility and value for money, our Ordnance Survey maps will make your marketing look professional and give potential buyers and tenants key location information. Simply enter the property address and click to order – we’ll provide the map within a couple of minutes! Give your audience key information that many agents don’t, while promoting your wider commitment to marketing with prospective vendors and landlords. Maps are provided as a high resolution download and on a URL, so you can add them your online and printed marketing with ease. No expiry. We’ll host the plan in your online account, which can be downloaded again at any time. Hopefully, you’ll come to sell the property again! 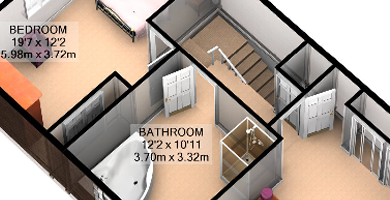 Bring your property marketing to life with 3D layouts.